People in industrialized countries spend more than 80% of their lives indoors, increasingly in air-tight buildings. These structures require less energy for heating, ventilating, and air conditioning, but can be hazardous to human health if particulate matter and potentially toxic gases, including carbon monoxide, ozone, and volatile organic compounds, from sources such as furniture, paints, carpets, and office equipment accumulate. 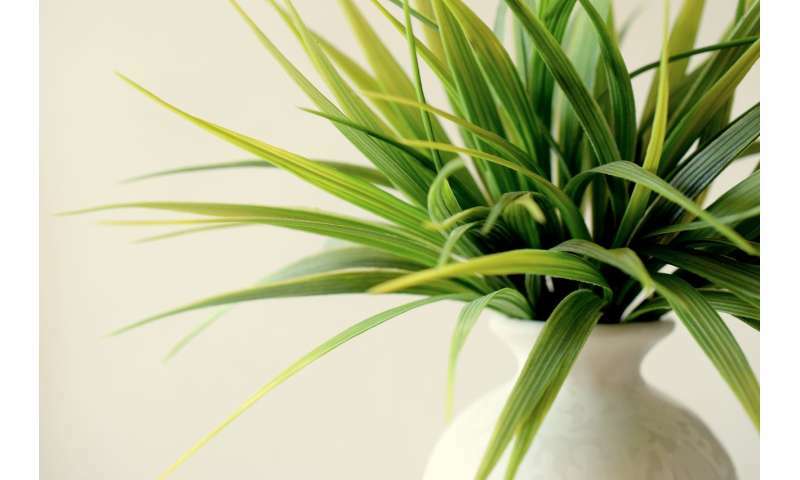 Plants absorb toxins and can improve indoor air quality, but surprisingly little is known about what plants are best for the job and how we can make plants perform better indoor. In a Review published April 19 in Trends in Plant Science, Frederico Brilli, a plant physiologist at the National Research Council of Italy—Institute for Sustainable Plant Protection, and colleagues conclude that a better knowledge of plant physiology, along with integration of smart-sensor-controlled air cleaning technologies, could improve indoor air quality in a cost-effective and sustainable way. Plants improve air quality through several mechanisms: they absorb carbon dioxide and release oxygen through photosynthesis, they increase humidity by transpiring water vapor through microscopic leaf pores, and they can passively absorb pollutants on the external surfaces of leaves and on the plant root-soil system. But plants are usually selected for indoor use not for their air-purifying abilities but for their appearance and ability to survive while requiring little maintenance. "For most of us plants are just a decorative element, something aesthetic, but they are also something else" says Brilli. Surprisingly little research has been done to quantify the effects of different plant species on indoor air quality. NASA performed pioneering work in the 1980s, but they relied on a simple experimental approach; studies with more sophisticated, modern research methods and modeling have not yet been conducted. Further research is needed identify the characteristics of the highest-performing plant species in indoor environments, including their morphology (i.e. leaf shape and size), anatomy, and physiology (i.e., CO2 assimilation rate). According to Brilli, such studies could show how to "optimize the use of plants indoors, in terms of how many plants per square meter we need to reduce air pollution to a certain level." Research is also needed to understand plant microbiomes: the populations of microorganisms (bacteria and fungi) that live with plants both in the soil and on leaf surfaces. This microbiome participates in the removal of airborne pollutants, but the contribution of different microbial species to removing pollutants is currently unknown. Some microbiomes could also have negative effects on human health, including triggering allergies and lung inflammation problems, so knowing how to identify and avoid those will be important. Brilli and colleagues do not envision plants replacing modern heating, ventilation, and air conditioning systems, but they argue that integrating plants with smart sensors networks and other computerized technologies could make those air cleaning more cost-effective and sustainable. Says Brilli, "plant physiologists should work with architects to improve the green indoors." There have now been many many studies of the pollution-reducing potential of houseplants. The author is a little late to the party. lochroma, with all due respect. The researchers in this article are attempting in-depth studies using recently developed instrumentation and strict methodology. Followed by rigorous analysis of verifiable data. Please feel free to list some of those articles you cite as equivalent to this research program. Because I would be interested in reading them. This brings up the issue of 'terrior'. While investigating the measurable effects of folk-medicinal herbs. I discovered there was no accuracy in quality of products. As with wine production. Each growing plot of an herb often produced quite different results in the medicinal qualities of the same plant. That is why many bottled wines sold, even of the same grape, are blends from different locations. The customers expect & demand a certain bouquet from a label. That raises health safety issues with blending medicinal herbs. When you cannot absolutely control the natural growth of each plant. "For most of us plants are just a decorative element, something aesthetic, but they are also something else"
Yes they are also something else, But let's not underestimate the positive impact of aesthetics on health, either. Well mack, since you want to 'branch' away from the subject of this article. When are you going to produce a working cold fusion prototype device for public verification required by the standards for application to the Patent Office? Unless there are armed guards on your cell door preventing you from creating such a marvel of the ages?